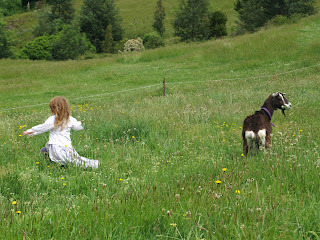 A goat in the garden: Grass, grass and more grass! Grass, grass and more grass! 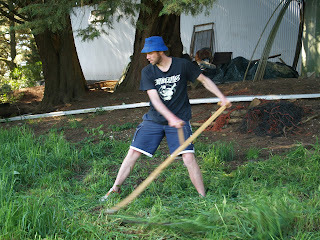 We have been having excellent growing weather this spring. Lots of rain, followed by warm weather, then rain again and so on. 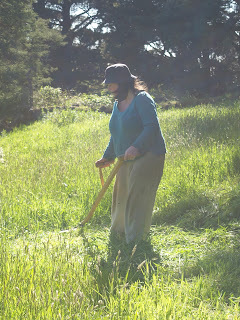 This means that the grass is really growing (far too quickly for our small herd of grazers). 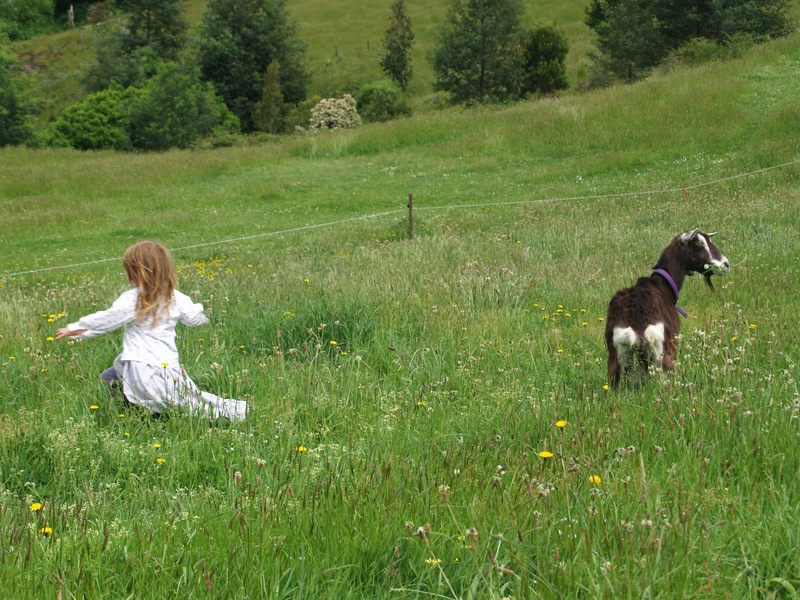 At this rate you wont see the animals (let alone the kids) as the grass will be taller! In time our herd will grow, and diversify, but for now we have to manage the overabundance of grass. The scythes have been getting a good workout, and my technique is improving so much. 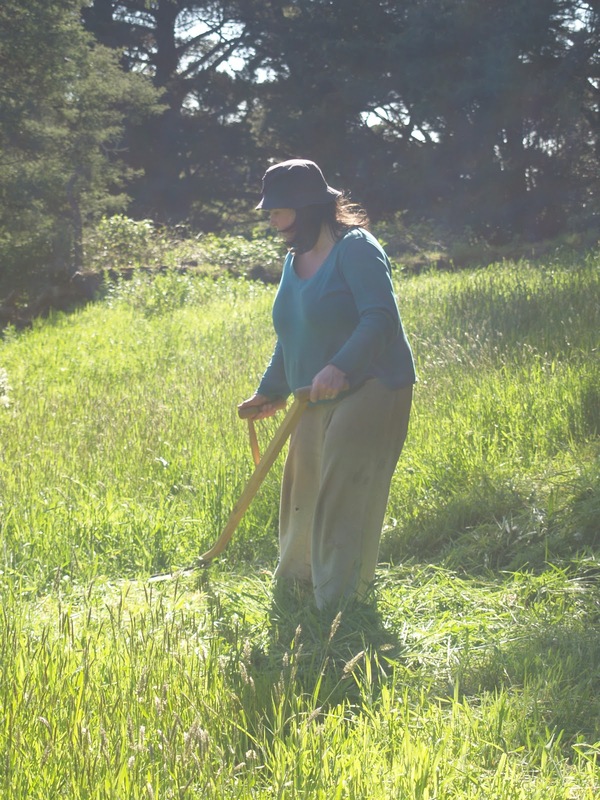 Its amazing how easy it can be to cut grass with a scythe, its almost effortless (although I wouldn't try and mow a few acres at a time!). Its more like fun than work. This year we will try and dry and store some of the cut grass as loose leaf hay. We don't have a huge need for hay in the winter - our weather is mild enough that we don't have to keep animals housed, and the grass still grows a bit during the winter. This year its all about experimenting with technique and dryness of the grass, I think next year we will be more serious about it. The vegetable seedlings in the garden have been growing strongly. We have fenced off another part of the garden to keep out the goats and chooks. Much better now. On a sad note, we have been having some trouble with foxes lately. A few of our 'friends' have now been lost. Disappointing and frustrating, as the attacks have happened during the day, and while we have been home. Broad daylight, with a dog and active children running around.... The fox is bold.